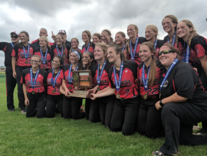 Pony E-News: Softball team wins state championship! Congrats to the girls softball team who won the state championship! The unseeded Ponies defeated #1 seed Park of Cottage Grove 5-1 to cap off a remarkable comeback season. The team hit a hot streak in the playoffs having only won two of their last 13 games in the regular season. Pitcher Allison Benning, catcher Torri Chute and infielder Tatiana Tabucol were named to the All-Tournament Team. Check out a highlight video of their big state championship win. At the boys and girls state track and field meet Isaac Krahn came in second in the 800 meters, Will Seck, Dylan Olson, Max Korth and Noah Johnson took 3rd in the 4x800 relay while Corrine Hale placed 3rd in the pole vault. The girls and boys golf teams both won their section championships. Senior Cole Jahnke was named one of eight finalists for the Mr. Minnesota Golf award. Read more. The girls lacrosse team defeated Mahtomedi 16-10 for the section championship. Attacker Abby Hagberg was named a finalists for this year's Ms. Lacrosse Award. Read more. The baseball team beat Roseville 8-6 to capture the section championship. Read more. Visit our website at GoPonies.org for info on sports and activities. Stillwater Area High School held its 142nd Commencement on June 2 at Roy Wilkins Auditorium in St. Paul. Congratulations to the 685 students in the Class of 2018! Twelve graduates were recognized for having unweighted GPA's of 4.0. Annabel Gregg served as the student speaker at the ceremony. Distinguished Alumni Maureen (Hooley) Bausch, Tracey A. Galowitz, Pamela (Ogren) Johnson, MS, RN, NEA-Bs, FAAN and David S. Ratte, Capt, USN (Ret.) were also honored. Read more. Watch a behind-the-scenes video from the ceremony. For photos visit our Facebook page. Recent grads Diana and Sandra Flores-Castillo have their sights set on a career in civil engineering. 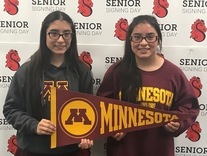 The twins will attend the University of Minnesota this fall after participating in an internship with the Minnesota Department of Transportation. Both girls hope their story inspires other girls, students of color or English second language speakers to consider a career in the sciences. Read more. 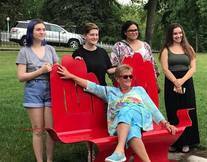 Stillwater students unveiled a bench they designed at Pioneer Park. The bench was made in honor of Jan George and her 30 years of work with the St. Croix Valley Red Cross. 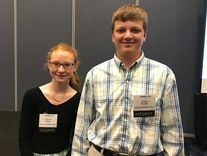 Thirteen Stillwater Junior High students began the project in 2016 as part of a summer art program with teacher Megan Beadle. Artist Allen Christian helped finalize and cast the design. The bright red metal sculpture, titled “Couldn’t Have Done It Alone,” is the ninth and newest addition to the St. Croix Valley Art Bench Trail. Read more. The Brothers Grimm hit the Community Theatre stage with an epic fairytale about wishes, family and the choices we make. James Lapine and Stephen Sondheim take everyone's favorite storybook characters and bring them together for a timeless, yet relevant, piece...and a rare modern classic. 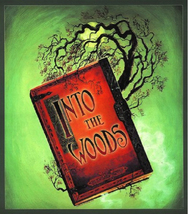 The Tony Award-winning book and score are both enchanting and touching. July 20th, 21st, 27th, 28th at 7 p.m.
July 22th & July 29th at 2 p.m.
School Board Chair Tom Lehmann has accepted an appointment as District Court Judge and will be resigning his board position effective June 21. The board vacancy will be filled by an application, interview and appointment process, managed by the remaining board members. Applications for the position will be available on the district website on June 22. In July, the Board will review the applications and interview potential candidates. 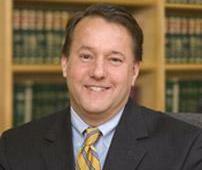 The goal is to have a successor appointed by mid-July and seated by late August. Read more. Notice is hereby given that the school board of Independent School District No. 834 – Stillwater Area Public Schools will hold a special meeting for a closed session for the purpose of evaluation at 4 p.m. on Wednesday, June 13, 2018 at Central Services, 1875 South Greeley Street, Stillwater. Notice is hereby given that the school board of Independent School District No. 834 – Stillwater Area Public Schools will hold a closed session for the purpose of evaluation after their regular business meeting on Thursday, June 21, 2018 at Stillwater City Hall, 216 North 4th Street, Stillwater. MN Statute 13D.05 Subd. 3. What meetings may be closed. (a) A public body may close a meeting to evaluate the performance of an individual who is subject to its authority. The public body shall identify the individual to be evaluated prior to closing a meeting.